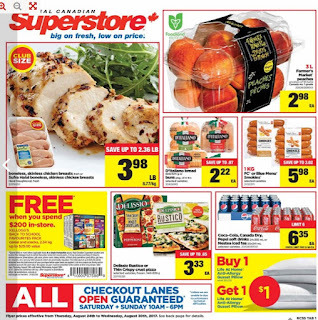 Real Canadian Superstore Ontario Flyer August 30, 2017. 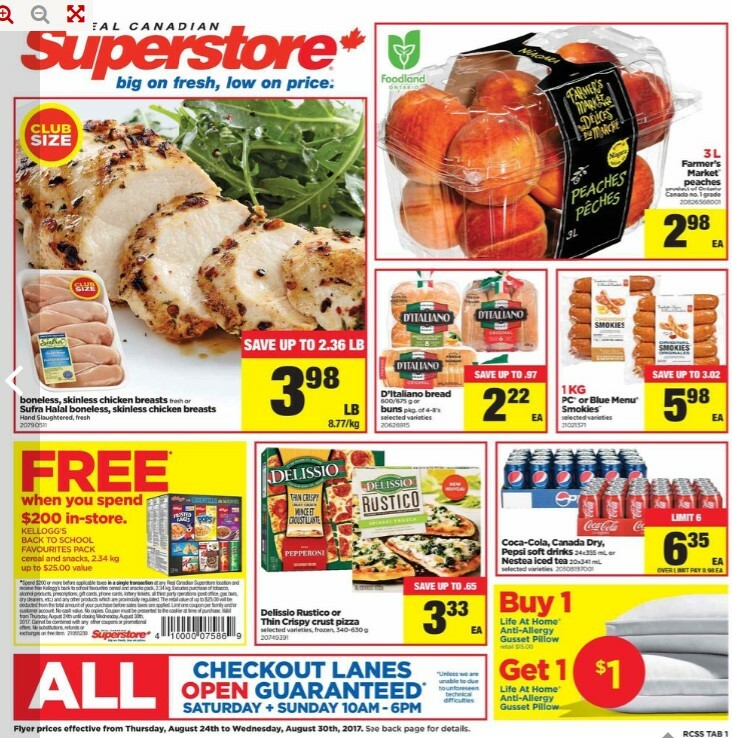 The real canadian superstore Canada, Big on fresh, low on price. 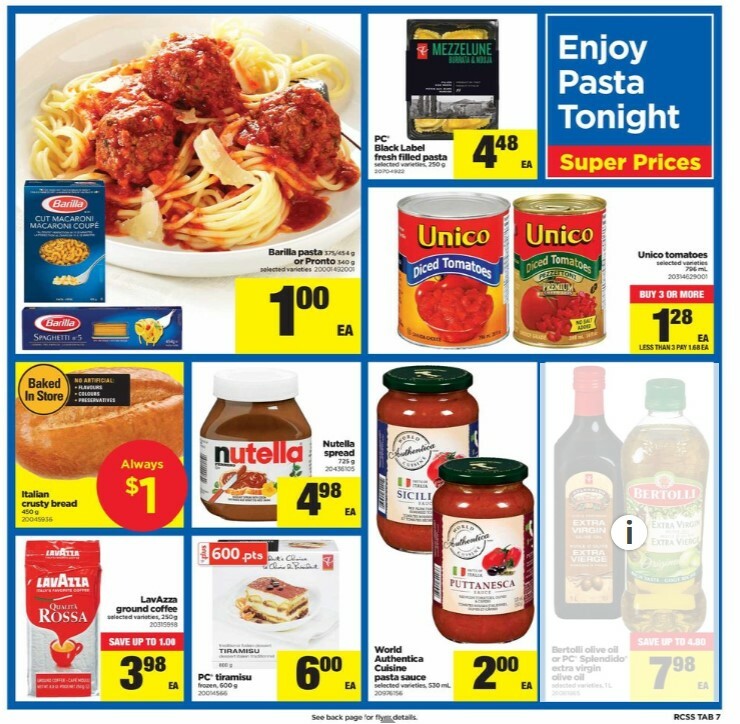 From your farmers, Fresh local produce, Meat, Flavours of Italy, Enjoy pasta tonight, Edi Mubarak sale, Stock up days flyer, Super brand days, also find back to school super prices flyer this week only at Real Canadian Superstore Ontario Canada. 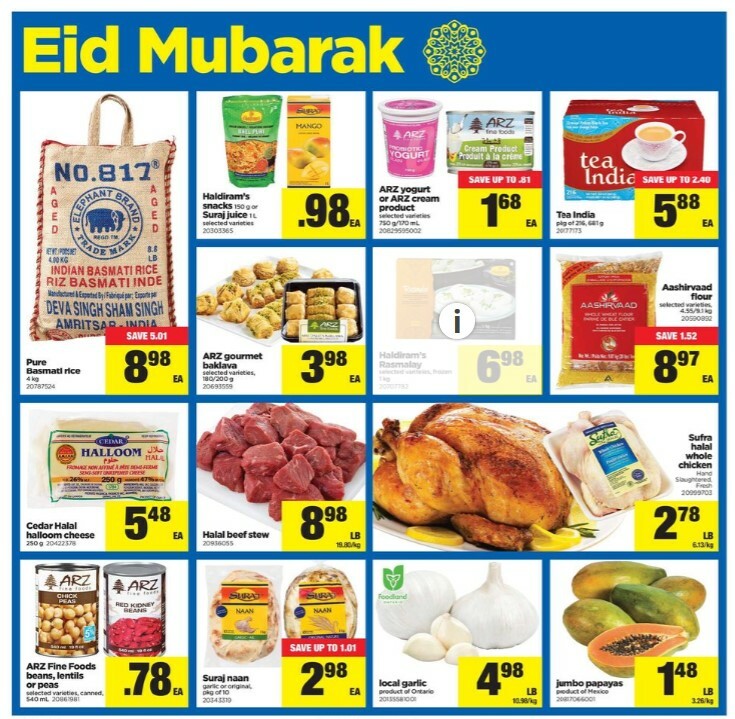 Buy cheap for Boneless, Skinless Chicken Breasts Fresh Or Sufra Halal Boneless, Skinless Chicken Breasts #20790511 $3.98/lb - Price Up to $2.36 Savings Hand slaughtered fresh. $8.77/kg. Club size. PC Or Blue Menu Smokies #21021371 - Price $5.98 Up to $3.02 Savings Selected varieties. 1 kg. Kellogg's Cereal And Snacks - Price $25.00 Free when you spend $200.00 in-store. Kellogg's back to school favourites pack cereal and snacks, 2.34 kg. 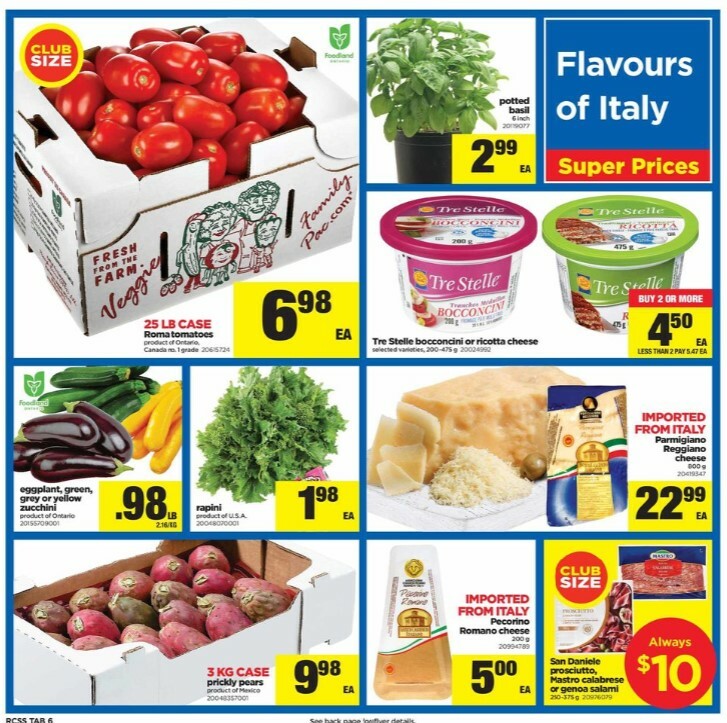 Delissio Rustico Or thin Crispy Crust Pizza #20749391 - Price $3.33 save Up to $0.65 Selected varieties. Frozen 340 - 630 g.
Coca - Cola, Canada Dry Pepsi Soft Drinks Or Nestea Iced Tea #20308197001 Regular Price $8.98 - Price $6.35 Pepsi soft drinks 24 x 355 ml. Nestea iced tea 20 x 341 ml. Selected varieties. Limit 6. Life At Home Anti-Allergy Gusset Pillow - Price $15.00 BOGO Free Savings Buy 1 life at home anti-allergy gusset pillow, get 1 life at home anti-allergy gusset pillow. 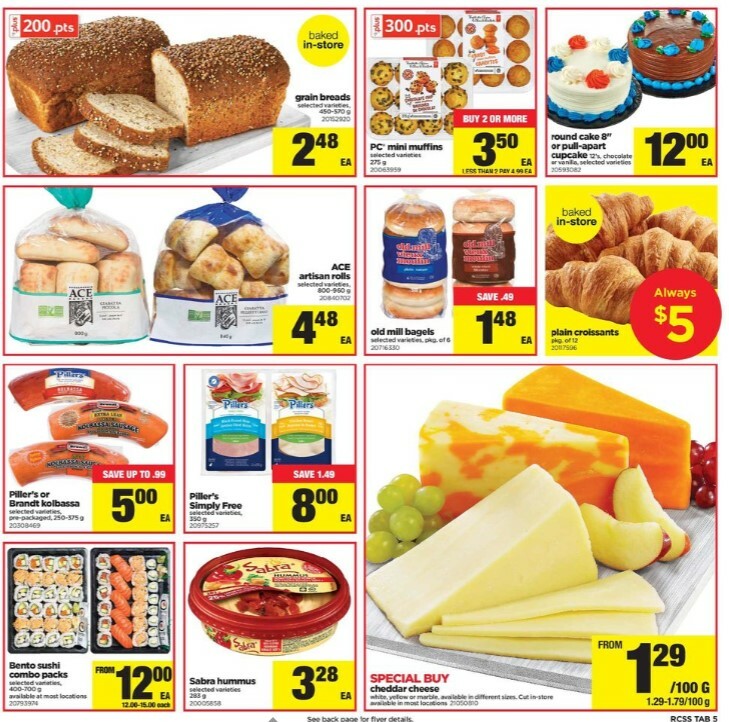 Meat and bakery flyer available on page 4-5. Flavours of italy with super prices can be find on page 6. 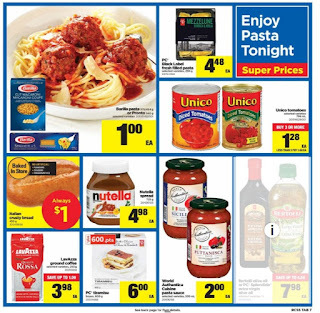 Shop for product with enjoy pasta tonight on page 7. Pure Basmati Rice Model #: 20787524 $8.98 - Now Price $5.01 Savings 4 kg. Haldiram's Snacks Or Suraj Juice Model #: 20303365 $0.98 - Now Price 150 g. Suraj juice 1 L. Selected varieties. ARZ Yogurt Or ARZ Cream Product Model #: 20829595002 $1.68 - Now Price Up to $0.81 Savings Selected varieties. 750 g / 170 ml. Tea India Model #: 20177173 $5.88 - Now Price Up to $2.40 Savings Pkg of 216, 681 g.
ARZ Gourmet Baklava Model #: 20693559 $3.98 - Now Price Selected varieties. 180/200 g.
Haldiram's Rasmalay Model #: 20707782 $6.98 - Now Price Selected varieties, frozen. 1 kg. Aashirvaad Flour Model #: 20590892 $8.97 - Now Price $1.52 Savings Selected varieties. 4.55/9.1 kg. Cedar Halal Halloom Cheese Model #: 20422378 $5.48 - Now Price 250 g.
Halal Beef Stew Model #: 20936055 $8.98/lb - Now Price $19.80/kg. 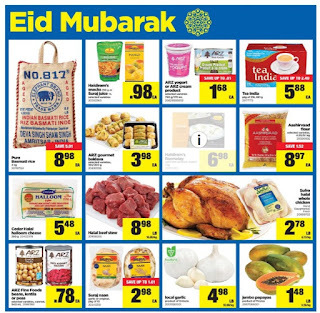 Sufra Halal Whole Chicken Model #: 20999703 $2.78/lb - Now Price Hand slaughtered, fresh. $6.13/kg.